The inaugural history symposium is an outgrowth of the tribe’s current ANA-funded history project. The format for the event featured presentations by historians and historical anthropologists with broad knowledge of native (and non-native) history in the American South that is relevant to the specific question of Euchee tribal history. Presenters included Robbie Ethridge, David Chang, Steve Warren, Steve Martin, Joshua Piker, Mary Linn, Cindy Tiger (Euchee) and Tamara Wilson (Euchee). Euchee (Yuchi) Tribe of Indians Chairman Andrew Skeeter hosted the event and I had the honor of serving as a sort of facilitator and master of ceremonies. The symposium and the festival as a whole was very expertly organized and staffed by a very large and effective group of volunteers from the Euchee community. The symposium program was organized chronologically and spanned the period from first contact with Europeans through to the present. Each of the presenters brought valuable knowledge to the table and there was much fruitful discussion among everyone assembled. I think that there were eye opening moments too for all involved. Those who were visiting Euchee country for the first time were, I know, impressed with the vitality of Euchee community life and the seriousness with which Euchee people pursue their language, culture and history work. For Euchee community members, I think that there was a deepening of understanding of how complicated, and often troubling, the historical narrative of the past 500 years of Euchee history is. (The story of native involvement in the colonial slave trade was a source of much discussion.) For everyone, there was renewed hope that the complexities of this story can be sorted out and presented in ways that will be valuable to both the community and to scholars who have so often misunderstood the place of the Euchee in the larger history of North America. The symposium was an all-day event on Friday (10/8/10) and then a briefer recap of the Friday discussions was held on Saturday morning as the first of the day’s festival events. The festival itself is always fun and this year it was particularly excellent. In addition to the symposium there were a number of other firsts, including much involvement from the Euchee language classes. Some hilarious skits and plays were staged in the Euchee language throughout the event. For the first time ever, the tribe selected its first tribal princess. All of the participants (and organizers) did a wonderful job and Miss Julia Wakeford was crowned the first Miss Euchee Princess. The festival also featured the first all-Euchee Color Guard and, for the first time, an old fashioned Corn Stalk Shoot with old style bows and arrows. As a scholarly conference that included amazing food, a stomp dance, a horseshoe tournament, hilarious Euchee comedy, lots of raffles and prizes, a bingo night, oodles of arts and crafts, cultural demonstrations, and socializing with lots of nice people from all over Eastern Oklahoma, the first Euchee (Yuchi) History Symposium set a standard for work and play that no regular academic conference can ever meet. The Euchee people have every reason to be proud of this very successful event. I am very thankful that I was able to participate. Update: Today (9-13-2010) I received my author copy of the book version of this project. I am happy to report that the two images that I provided showing contemporary dress (including that worn by women) are included in it. As discussed below, they do not appear in the online/database version. As often happens with encyclopedias and other works of this type, I did not get a chance to review page proofs or the final copy edited manuscript. This has resulted is some less that ideal outcomes. I may eventually have the patience to write a full erratum to the piece, but here are some items that I want to apologize for. I have only seen the version appearing in the Berg Fashion Library database. The print version may be different in some ways of which I am as yet unaware. The following comments are based on the Berg Fashion Library version. The publisher was provided with a number of images illustrating contemporary Native American people wearing the kinds of clothing discussed in the essay. None of these were put to use and (if those that I had provided were not suitable) I was not engaged to find alternatives. Only two historic paintings by non-native artists and one object image of museum artifacts are used. This omission unfortunately fosters the general misconception that Native American lifeways are a thing of the past and that they are only preserved (via ethnographic documentation) by and for non-natives. I hope that my text (as published) sufficiently counters this widespread tendency. I have no idea why it had to be this way. The publisher provided a caption to one of the images that was used that is misleading. From among the images that I suggested, they chose to publish the image of a native man from (what would be) Virginia associated with the artist John White. Because in the chapter I discuss tasseled yarn belts and sashes, this image was captioned: “A North American Indian wearing a tasseled sash, ca. 1590, from a painting by John White.” I would certainly not have captioned this particular image in this particular way. The apron worn in this image is relatively anomalous for the dress of the region and for Native North America in general. It appears to be tied in the back and what we see hanging in the back (between the man’s legs) seems to be the apron ties (of animal hide?) presented in a unusual but decorative way. The closest thing to this in the documentary record or present-day practice, are the animal tails worn by some men when playing “match game” (stickball), as among the Oklahoma Muscogee (Creek) and Oklahoma Seminole today (and the Choctaw historically). In the Mississippian engraved shell images, the historic-period paintings, and today, yarn sashes with tassels are worn so that the tassels fall from one or both hips (or are tied at one hip). 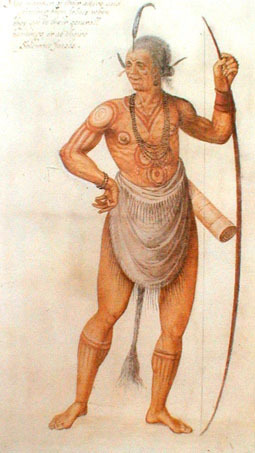 This can be seen in the painting of a Seminole man by Charles Bird King that was also published in the article and in the shell images and contemporary photographs that I suggested but that were not used. I did suggest the use of this early Virginia image, but only because I had devoted considerable space to discussing the total Virginia corpus as a source of information on dress and adornment in the contact era. I had asked that it be paired with an image of a woman from the same time and place so as to insure gender balance across all of the images. As published online, there are no women’s objects shown or images of women wearing native dress. I apologize for this unanticipated and regrettable outcome. My sentence: “The Yuchi have a different colonial-era history and continue, into the twenty-first century, to speak their own unique language—a language isolate unrelated to other known tongues.” in which I used the technical term “language isolate” but then preceded to explain the meaning of this terminology became: “…unique language—a language isolated and unrelated to other known tongues.” This just does not mean anything sensible and it is the typical kind of “improvement” that a copy editor wanting to enhance the accessibility of an work would make in the absence of any specialist knowledge. I do not mind this as one step in the process, but it never works in an context in which the scholarly author lacks the ability to catch problems introduced by the process. A gorget originally was a steel or leather collar designed to protect the throat. It was a feature of older types of armour and intended to protect against swords and other non-projectile weapons. Later, particularly from the 18th century onwards, the gorget became primarily ornamental, serving only as a symbolic accessory on military uniforms. Because, in the historic period, this elaborate necklace-strung item of adornment–a large curved object worn suspended on the upper chest–was known in English as a gorget, scholars of the region like me (perhaps too sloppily) have extended the terminology back to refer to large shell decorations worn similarly. Those obviously do not derive from European armor and they two kinds of adornment provide an illustration of the kind of convergence of European forms and Native styles that I was trying to discuss in the essay. In any event, the copy editor was seeking to help readers by introducing a definition of gorget, but the definition is anachronistic in that Southeastern people did not wear armor-like neck coverings. I would have been very happy to have helped fix this mistake if I could have. The published version includes a list of references but the citations that had been provided in the manuscript linking particular statements to particular works were removed in conformity with the style of the volume. I am sorry about this. Thankfully the reference list itself was preserved. If a work appears there, it was used with direct citation in the original manuscript. I wish that I had a way to share the original manuscript but this was a project that I was recruited to participate in before I had given up engaging with commercial publishers all together. Maybe someday I will have a chance to try to address the topic again in a different and more open venue. Although I am disappointed with this sort of outcome, I do not want to sound overly bitter. 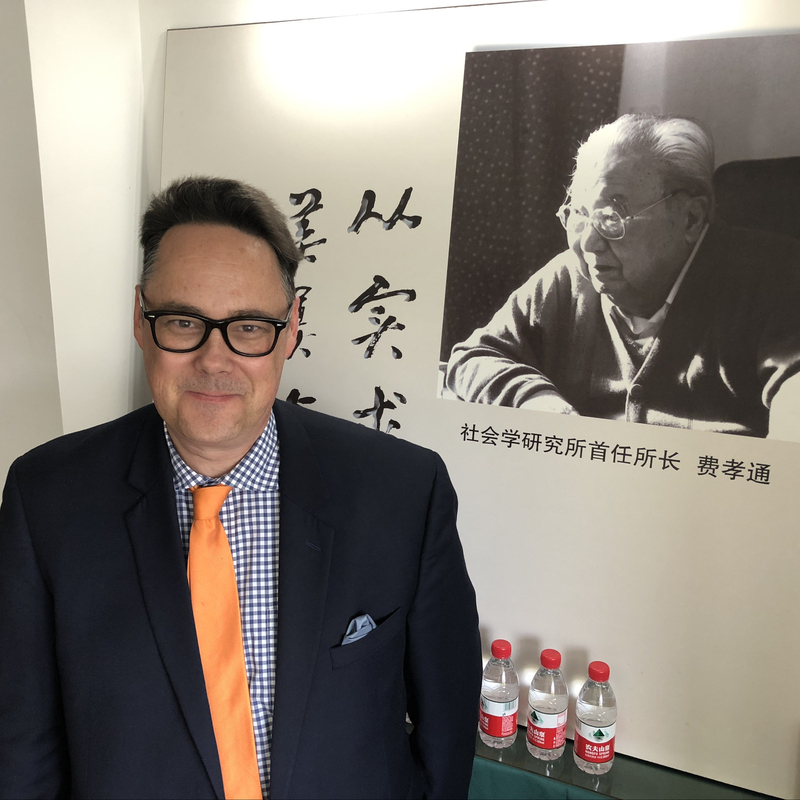 I appreciate the work that the publishers and editors have created and nothing about this experience is particularly out of the ordinary for the commercial encyclopedia publishing space. For those who can get access to it, some good information, I hope, can still be found in my contribution. The kinds of frustrations that accompany, or are generated in, projects like this motivate my enthusiasm for doing scholarly publishing in new, better, and more open ways that are less impacted by the ramifications of hard business decisions made in a dysfunctional marketplace. Not long after the publication of Linguistic Diversity in the South: Changing Codes, Practices, and Ideology, I was asked by an anthropology journal to review the book. The subject interested me greatly and I was acquainted with the work of the editor and several of the volume’s contributors. In a relatively timely fashion, I submitted the brief review that follows here. At the time, the journal’s editors asked that I expand the review to focus on the contents of the volume in greater detail, thereby bulking what amounts to a book note up to the scale of a full scholarly review. I fully intended to give this a try, but in the constant flow of new tasks, the matter was delayed so long that it was lost sight of. Rediscovering the review today, in the course of organizing my writing-related files, I experienced regret that I did not follow through and see the review through to publication. Rather that attempt to expand it at this stage and secure journal publication for it, I offer it here for those who know my interest in Southern cultural studies and linguistic anthropology and for those web searching researchers whose queries may lead them to the book or my comments on it. I apologize to the volume’s editor, contributors, and publisher for my lack of follow through. Thanks go to all involved for assembling a valuable contribution to the literatures in these fields. The actual review follows. 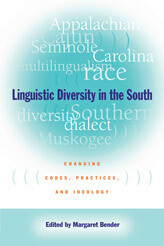 Linguistic Diversity in the South: Changing Codes, Practices, and Ideology. Southern Anthropological Society Proceedings, No. 37. MARGARET BENDER, editor. Athens: University of Georgia Press, 2004. Pp. 141. $19.95 (paper). Linguistic Diversity in the South is comprised of eight fine essays and a solid introduction contextualizing the volume’s contents and its place in contemporary sociolinguistics and linguistic anthropology. The papers gathered in the volume were originally delivered at the Southern Anthropological Society’s 2002 keynote symposium, which was organized by the volume’s editor, Margaret Bender. Contributors range from enterprising graduate student researchers to distinguished senior scholars. All offer brief, nuanced ethnographic or sociolinguistic treatments of language use in the southern United States. A great strength of the volume is the manner in which it, without attempting to be a comprehensive survey, offers a rich sampling of Southern speech-communities, ways of speaking, and language ideologies. The papers explore language in Native American [Lumbee (Walt Wolfram), Muscogee/Creek (Pamela Innes), Seminole (Susan E. Stans and Louise Gopher)], Mulungeon (Anita Puckett), Scotch Irish (Puckett), Cajun (Shana Walton), Appalachian (Kirk Hazen and Ellen Fluharty), Outer Banks (Wolfram), and North Carolina African American communities (Christine Mallinson). Blair Rudes contributes a paper historically surveying multilingualism, linguistic complexity and change in the Carolinas since contact. Bender’s introduction reflects experiences gained in her own work among the North Carolina Cherokee and links the volume’s contributions to contemporary theoretical concerns in linguistic anthropology, especially research on discourse, contact, maintenance, shift, and ideology. It is exciting that the volume provides evidence that a critical mass of contextual research on language use in the Southern United States has been reached. Because of the conference proceedings format shared by all Southern Anthropological Society volumes, the papers contained within Linguistic Diversity in the South represent short, accessible samplings of broader, more detailed research programs. In this instance, this is a virtue, as, for instance, scholars consulting the book for its studies of language in Native American communities, easily also gain concise accounts of other Southern peoples and varieties. While many interesting and important communities are not treated in the volume, as Bender is quick to note, it does offer a clear picture of how linguistically and cultural complex the contemporary South is. The book thus counters conventional assumptions of Southern linguistic homogeneity at the same time that it proves to the fields of linguistics and linguistic anthropology that key general issues can be very productively examined from the perspective of the region’s ethnography.